Nick Glimenakis, who marched in the tenor line with East Coast Jazz for the past two years, sent in this one. "This picture of the tenor line at finals in Brockton, Mass., this summer was taken after our world-championship performance. 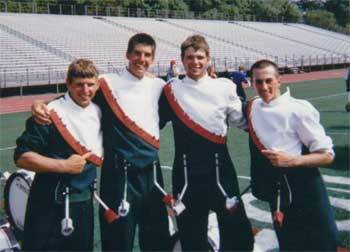 From left to right: Brett Johnson, me, Chris Lawlor (Nibbles) and Tim Sepe. The summer with these guys was outstanding and marching with them was an unbelievable experience. Hope to see 'em all next year! Sweet late!" Thanks Nick! E-mail your best shots from the summer to dave@dci.org along with where and when the photo was taken. Send some biographical information about yourself as well. We'll give you full credit. Also, let us know if you want your e-mail address included.